Our 790 Series, ClassOne™ CleanTop® optical top design is an extension of the original CleanTop adapted for cleanrooms. It is Class 100 cleanroom compatible with an all-stainless steel construction. Maximum and standard damping levels are available as well as stainless CleanTop cups, if preferred. ClassOne, like all TMC CleanTop optical tables, provides the highest core-density and smallest honeycomb cell area available. Individual cups under each tapped hole are airtight, making the top spill-proof. 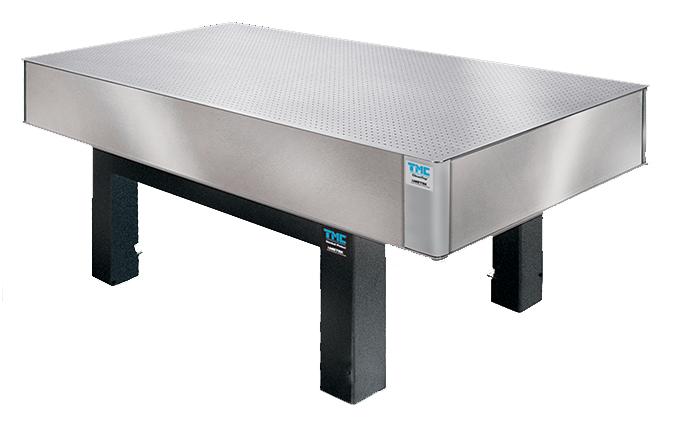 The ClassOne optical table top is available in a full range of standard and custom sizes and two damping levels. TMC offers a choice of support stands for its clean room-compatible optic table tops, depending on your application. Choose from rigid support or passive pneumatic air vibration isolation for most applications. For more vibration-sensitive work or noisy environments, a TMC active vibration cancellation system may be required.